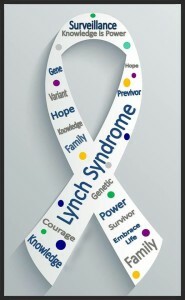 Ordinarily, one of two events occur which ultimately result in a diagnosis of Lynch syndrome. Either one gets the cancer and a Lynch syndrome diagnosis follows or a close loved one contracts cancer and family members are tested for Lynch syndrome. With Lynch syndrome, there is always a “sacrificial lamb” who opens the door so others may live. If you ask any person who has been diagnosed with cancer or Lynch syndrome of their initial emotion experienced upon diagnosis, three words: overwhelmed, fearful and immense grief, consistently spill out as the description of their response to the devastating news. Grief is very common to loss and a diagnosis of cancer or a syndrome predisposing one to inherited cancer is a loss–a loss of good health, a loss of control, perhaps a loss of a body organ, a loss of innocence, a loss of hope that the “family cancer thing” had eluded you, a loss of independence, a feeling of guilt and loss if one is negative for the syndrome while other family members are positive, etc. Working through that grief is a process. First, most of us cry, and then, as SURVIVORS and PREVIVORS, we stand up and take care of business because we simply do not have the luxury of time to actively participate in the advanced stages of grief by focusing upon the anger and fear. There is too much to do and the stakes are far too high. We have to learn to pick our battles and save our energy for the highest priority of survival. Certainly, its only natural those emotions would arise on an intermittent basis but often they quickly drift away as moments fleetingly disappear as time flies past us. What is often misunderstood and interpreted as “courage” by others, is simply pure survival to us. We realize we may not have the luxury of time to involve ourselves within negativity, especially when it doesn’t present positive results. We totally understand there are two options we have within our lives and we have to immediately commit to one or the other of those options. We can either commit to life or commit to denial though I’ve never known anyone who has been successful over the long term in exercising denial and live long enough to talk about it. One thing about Lynch syndrome survivors and previvors…very seldom do you ever hear, “Why me, why did it happen to me?” We may not like it but we understand it. It may feel unfair but we realize, until there is a gene therapy or even a good standard of treatment, there is little we can do except get annual screenings, adopt an active lifestyle, keep a positive attitude and watch our diets. We understand it is part of our legacy from our families and those who came before us were far worse off than us. They didn’t have hope or technology to thwart the growth of a cancer. They simply were diagnosed with cancer and at a certain point of their life, went to bed and died. Us? Today, we live!